January was a month of change and preparation for Elgar Shirts. The workshop was a haven from the wintery weather outside as we made plans for future garments and readied ourselves for coming events. Thank you to customers for sending in reviews and feedback this month. It’s rewarding to see so many photos of happy customers in their Elgar Shirts clothing. If you’re happy to share we’d love to receive more snaps of you wearing our clothes. You might have noticed a slight redesign to our website this month. We’ve changed our menu options so that we have an area for ‘Sale’ items and ‘Trousers’. We’ve been able to offer discounts on many of our garments this month as we make space for new cloth and new garments. 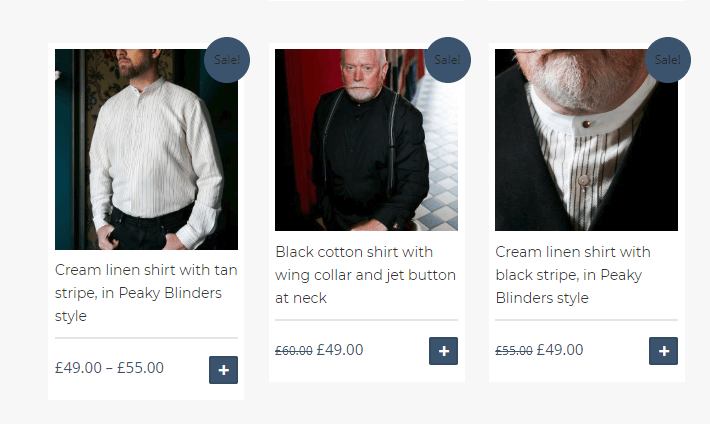 Among the discounted stock you will find some of our popular Peaky Blinders shirts, our raw silk shirt and some of our robes and nightshirts. We also have a range of one-off waistcoats that we’re able to sell at a discounted price. These waistcoats are completely individual, made from a variety of cloth remnants that we couldn’t see go to waste. We will be updating this stock as we make more – so keep an eye out! As we previously mentioned, Elgar Shirts is stepping into new territory this year and making trousers for the first time. Customers at the Whitby Steampunk Weekend (9th & 10th February) will be the first to try and buy these high waisted men’s trousers, but they will be available to buy from our website in due course. Our trousers are buttoned to wear with braces. We’re also making them with a button fly and adjustable fit on the waist. Our events page has been updated to reflect the shows and festivals we will be attending in 2019. First up is the steampunk weekend in Whitby Pavilion, with the Cambridge Living History Market and the lively TORM (The Original Re-enactors’ Market in March. In addition to these events being entertaining and a fantastic shopping experience, they’re a great place for us to show you our new garments. We hope to see you there!